I was looking for a particular old letter today, and frustratingly enough, I couldn’t find it. One of the reasons I am writing this blog is to practice telling stories of my family as Sally and I begin work on a family memoir. I am in possession of a seriously unorganized repository of family history in the form of mostly photos and birthday cards from our childhood. There are also some very precious letters and newspaper articles from Mom’s association with an Omaha World-Herald reporter who was her classmate at Creighton. I was looking for one of those letters that Mom wrote, but before I laid hands on it, I found this old newspaper clipping. Omaha World-Herald article from sometime in 1961. Yes, that is me in an artistic phase I don’t remember and has not been duplicated since, at least in paints. Most of my brothers and sisters had preschool at the Joslyn Memorial Art Museum here in Omaha. I do remember those wonderful days and used to know every nook and cranny of that building from so many hours spent there. And I thought this article – I have seen it before – was from that time in preschool, but the text clearly indicates otherwise. Thirty-six children and their parents participated in a kite-decorating class at Joslyn Art Museum Sunday afternoon. 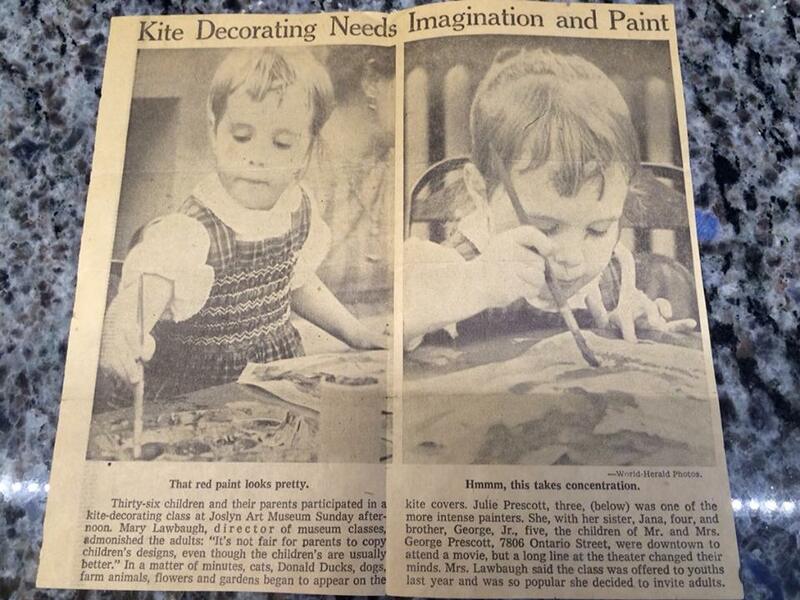 Mary Lawbaugh, director of museum classes, admonished the adults “It’s not fair for parents to copy children’s designs, even though the children’s are usually better.” In a matter of minutes, cats, Donald Ducks, dogs, farm animals, flowers and gardens began to appear on the kite covers. Julie Prescott, three, was one of the more intense painters. She, with her sister, Jana, four, and brother, George, Jr., five, the children of Mr. and Mrs. George Prescott, 7806 Ontario Street, were downtown to attend a movie, but a long line at the theater changed their minds. Mrs. Lawbaugh said the class was offered to youths last year and was so popular she decided to invite adults. It’s an old, faded and yellowed piece of newsprint, but today, in my fingers, it’s like holding onto treasure. I found it folded inside a letter than my Aunt Sandy sent to me about nine years ago. In the note she mentions the dress I am wearing that she remembers buying for me as a gift (probably for my third birthday). “I always loved the little plaid dresses with the smocking,” she wrote. Even forty-some years later, she remembered the dress. It’s treasure to me for so many reasons. First and foremost, it is a reminder that there was a time when my sisters and brothers and I had a mom and a dad who liked to do things with us. My dad worked hard every day at the family print shop, but there were wonderful weekend days when we would go to the movies together. Mom died when I was seven, which was just four years after this was in the paper. She was ill then, but went on to give life to what would eventually be a family of seven children. Secondly, we didn’t have a lot of money. I can imagine how hard it was to stretch it far enough to send each of us to preschool. And not only preschool, but one in an art museum where we would get to paint and to sculpt and to explore the wonders of a beautiful architectural space in our own city. I can still stand in the fountain court of that building and remember the sounds and the smells of that space from 1961! Finally it’s a treasure because mom and her family stayed connected and shared their lives through correspondence because they lived so far apart. It was important to them to mark those moments and share them with each other. Aunt Sandy saved that article all those years so she could one day send it back to me as a gift of a memory. And that is what it is. It’s a treasure. I can’t wait to uncover more. I don’t remember going to the museum for pre-school or anything else, but I love that you can stand in the courtyard there and remember still. It’s amazing to me how time can rewind in certain places where strong and good memories were born. I wonder what movie our mother was taking three young children to that had a long line!